Even at an early age, Herman Goering already knew what he wanted to become. He was known to have a high IQ which he used to his advantage. His first experience was during the World War I when he joined the infantry. It is not all the time that he succeeded with all his missions but he was able to gain awards as his position continued to rise. His association with Adolf Hitler made him more famous especially among the Nazis and the commoners. Goering was born when the time his father was the consul general in Haiti but later on the family was just depending on the their father’s pension. They live in a small castle called Veldenstein which is located near Nuremberg. At an early age, Goering was already interested to be a soldier. He loved playing with his toy soldiers and often times would dress up as one. At the age of 11, he was sent to boarding school in Ansbach, Franconia where he suffered from lack of food and ruthless regulation. He sold his violin to pay for a train ticket so he could go back home. By the time he reached 16, he was sent to the military academy in Berlin Lichterfelde, where he graduated with honors. He was known to have a superior IQ of 138. Although anti-Semitism was widespread in Germany during this time, his parents didn’t practice this belief. Hermann Wilhelm Göring was born on August January 12, 1893 at the sanatorium Marienbad in Rosenheim, Bavaria. His parents were Heinrich Ernst Göring who was once the first Governor-General of the German protectorate of South West Africa and Franziska "Fanny" Tiefenbrunn who was from a poor Bavarian family.Goering has 4 siblings namely Albert Göring, Karl Ernst Göring, Olga Therese Sophia Goring and Paula Elisabeth Rosa Göring. His 2 sisters were from his father’s first marriage. His first marriage was on January 3, 1923 with Baroness Karin von Kantzow in Stockholm but she died on October 17, 1931 due to tuberculosis. On April 10, 1935 in Berlin, Goering married the actress from Hamburg Emmy Sonnemann. They were blessed with a lovely daughter named Edda Göringwho was born on June 2, 1938. During the World War I, he joined the infantry but suffered from rheumatic fever. It was in 1914 that he became a flying observer where he got awarded Iron Cross, First Class. He wanted to improve his position so he began studying to become a pilot. With his added knowledge and skills he was posted to Jagdstaffel 5 on October 1915. He remained focus on his missions and was later on awarded with Ordre Pour le Merite in 1917. He was also appointed Commander in the Red Baron's fighter squadron which is commonly known as the Flying Circus. This was the prime of his career as he made an oath of allegiance to Adolf Hitler. He was appointed as the commander of SA. In 1932, he was the president of the Reichtag, Reich Minster without a Portfolio, Prussian Minister President, Reich Commissioner for Air and Prussian Minister of the Interior. As he was found guilty of all four counts which he was accused of, he committed suicide 2 hours before his execution on October 15, 1946 in Nuremberg, Germany. He ingested a cyanide capsule that he smuggled into the jail. Hermann Goering’s name would always be associated with Adolf Hitler and the Nazis. No one could ever forget the millions of casualties during their leadership. He used his powers to benefit him by confiscating Jewish property, collecting big bribes and getting kickbacks from industrialists. He was also known for his love of music. He was infamous for looting from different museums, stealing from Jewish collectors and buying songs. 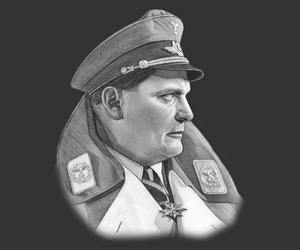 This picture of Hermann Goering is Copyright © June 2014 Siteseen Ltd. We only allow this picture to be used for printed non-commercial purposes and particularly encourage it's use for printed educational non-commercial purposes. This Hermann Goering picture is not in the Public Domain. 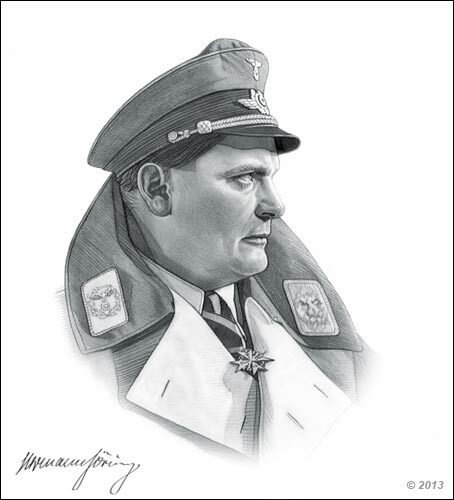 3) Use of this Hermann Goering picture, or any of our pictures on websites re-distributing copyright free material is strictly prohibited.